Military Appreciation Month is celebrated in May, but at Omni Financial we show our appreciation to service members all year long. In addition to these local activities, the entire Omni Financial organization participates in its annual “Holiday Giving Program” that provides military members in need with gift certificates good for a free Christmas ham. 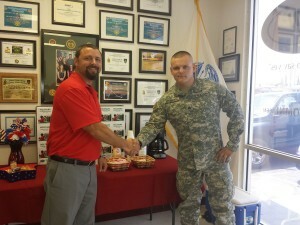 And this month we are conducting our bi-annual “Military Appreciation Days” program, where service members and their families are invited to visit participating offices for refreshments and a chance to win a TV. From charity event sponsorships to fundraisers for service members in need, Omni is always looking for ways to “give back” and show our military how much we appreciate their service and sacrifice.